The Marcus Landslide Trail forced me to say something I never thought I would admit: I wish I had stayed awake more often in science class. A half-million years ago a nuclear bomb went off in the McDowell Mountains. At least that’s the amount of energy that was expended according to scientific estimates. A great slab of mountain suddenly sheared off, plunged earthward and roared across the valley floor. Nearly 26 billion pounds of rock, soil and vegetation flowed about a mile in a furious torrent, reaching speeds of 44 miles per hour, before finally coming to rest. The noise must have been deafening. The wall of dust and dirt thrown skyward must have blotted out the sun. It’s hard to believe now as I walk through this peaceful place. I pause frequently to admire a few small wildflowers that are elbowing aside cactus and stone to flash their smiles skyward. Of course, that tale of long ago cataclysm and violence unfolds through the interpretive signage along the wide smooth path. 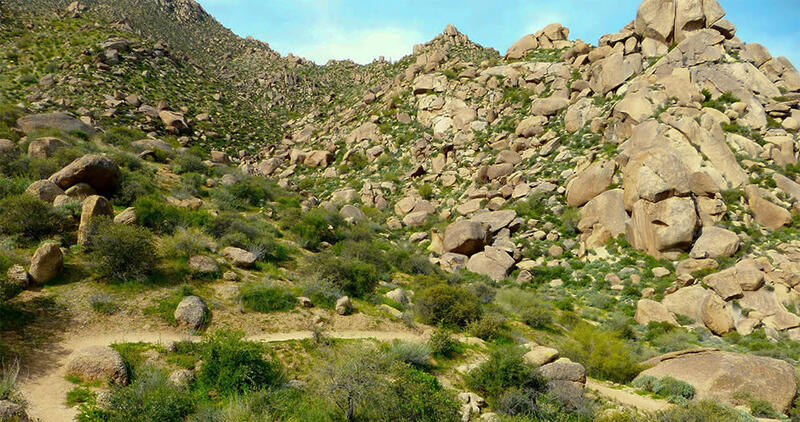 The Marcus Landslide Trail is located in the southern portion of Scottsdale’s McDowell Sonoran Preserve, leaving from the Tom’s Thumb Trailhead. 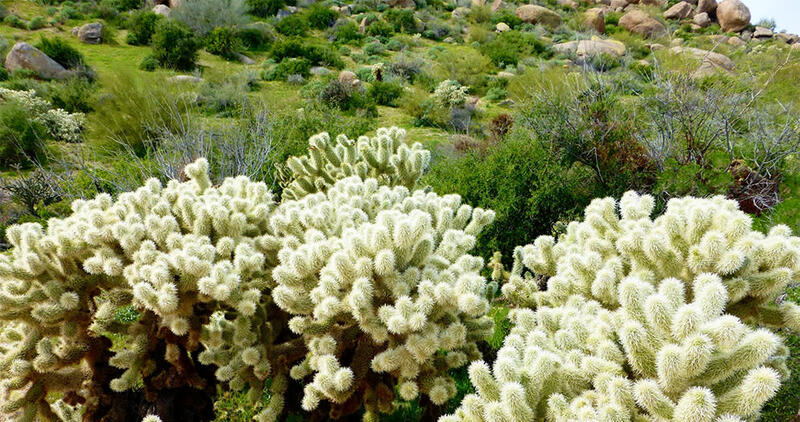 It ambles along the base of the mountains for 1.5 miles, cutting through a virtual forest of cholla cactus. The smaller, spine-intensive teddy bear cholla is savagely fuzzy. The taller chain-fruit cholla takes on a Dr. Seussian quality with its weirdly drooping branches and haphazard attitude. Beautiful to look at, both will happily stab any part of you that gets too close, so stay on the trail. Rising above is a collection of boulders as big as cars and cottages. The ridgeline is toothy with them. No wonder this is a popular destination for rock climbers. I scan the cliff faces but don’t see anyone crawling up them like tiny fearless spiders today. Despite all the eye candy, I pause to read every sign. The narrative laid out puts meat on the bones of everything I see. I learn about the erosion and subsurface weathering that causes some rocks to take the form of giant mushrooms and why some boulders are covered with lichen. As the trail curves around closer to the mountains the signage identifies the breakaway scar, a concave scoop along the second highest ridgeline in the McDowell Mountains, known locally as East End. Just then, the level trail tilts sharply uphill. I realize suddenly that I’m climbing the slidemass. This long hump of land stretching across the desert floor had once been part of the mountain. It’s a levee in search of a river. The slidemass is roughly 4,000 feet long, 1,650 feet wide and rises more than 100 feet above the original land surface. The trail makes a loop of 0.7 miles as it picks its way through the maze of jumbled boulders that took such an abrupt journey eons ago. Today they seem perfectly content where they are. I take my time to savor some long-range views. And I stop frequently to scan the ground, searching for mammoth tusks poking up through the brittlebush. I have this image in my head of great shaggy mammoths grazing peacefully at the base of the mountains when suddenly there’s a thunderous explosion above them and half the cliff chases them across the valley. Sure, they made a run for it but what about the old mammoth, the one with a limp? You know he couldn’t stay ahead of that freight train of stone and soil. He’s probably buried beneath my feet, maybe with a few more of his herd mates. At least, I’m pretty sure mammoths roamed this landscape back then. Man, I wish I hadn’t slept through so many classes. But that science book was the softest pillow I’ve ever known.